Movie: "Harry Potter and the Sorcerer's Stone"
An orphan named Harry Potter (Daniel Radcliffe) discovers on his 11th birthday that he is a well known wizard and has been invited to attend the elite Hogwarts School of Witchcraft and Wizardry. 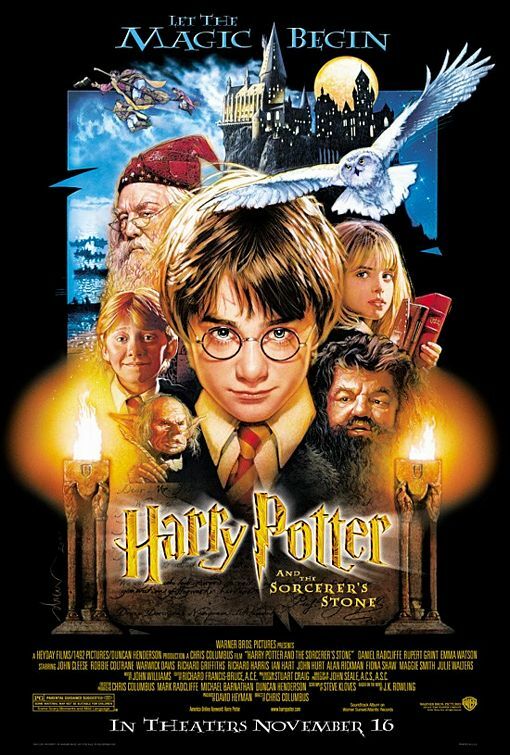 "Harry Potter and the Sorcerer's Stone" is directed by Chris Columbus and is the first installment of eight films based on J.K. Rowling's series of "Harry Potter" books. It stars Daniel Radcliffe as the titular Harry Potter, as well as Rupert Grint as his best friend Ron Weasley, and Emma Watson as their friend Hermione Granger. Joining them are Richard Harris as the original Professor Albus Dumbledore, Alan Rickman as Severus Snape, Maggie Smith as Professor McGonagall, Robbie Coltrain as Hagrid, Zoë Wanamaker as Madam Hooch, Ian Hart as Professor Quirrell, and Warwick Davis as Professor Flitwick, among many others, who comprise the staff at the Hogwarts School of Witchcraft and Wizardry. As a baby, Harry's parents were murdered by the evil Lord Voldemort. Harry is left to be raised by his unpleasant aunt and uncle Petunia and Vernon Dursley, played by Fiona Shaw and Richard Griffiths, who abuse Harry and overly spoil their rotten son Dudley, played by Harry Melling. On his 11th birthday, Harry discovers he is a wizard and is invited to attend Hogwarts as he is thrust into a world he never dreamed existed. This film is mostly an introduction to the magical world of Harry Potter. We start to get a glimpse into the lifestyle of wizards and witches, including things like magic wands, flying brooms, mail delivering owls, different houses (Slytherin, Hufflepuff, Gryffindor, and Ravenclaw) that separate the students via a talking sorting hat, Quidditch, and every flavor jellybeans. Harry learns about his past and how he became famous by being "the boy who lived." This film also begins the story of Harry, Ron, and Hermione's bond as friends, and introduces the audience to their foes, a fellow student and member of Slytherin named Draco Malfoy, played by Tom Felton, and his two minions Crabbe, played by Jamie Waylett, and Goyle, played by Josh Herdman. We very much enjoy this beginning of the Harry Potter film series. It is a fun family adventure with a compelling story that keeps you engaged throughout its run time, always politely poking and prodding that there is a bigger, more magical fantasy around every corner. It is full of beautiful set pieces and tremendous visuals that help bring this intricate, crazy, splendid world to life. This is a story that can appeal to everyone both young and old. The cast of veteran actors that make up the staff are fantastic in the roles, and the young newcomers are quite good in their own right as undiscovered child actors who have been thrust into this vast universe of magic. We really do believe Radcliffe, Grint, and Watson as fast friends, and as they go on their first adventure together, it's not hard to see how and why this series exploded. It's full of suspense, wit, peril, adventure, brilliant CGI (for 2001), and above all, a mostly faithful adaptation to its source material. It's hard to believe it's been 15 years since the release of "Harry Potter and the Sorcerer's Stone," but we love it just as much today as we did when it first came out. This a wonderful, visually striking, fun, adventurous beginning to the wizarding world of Harry Potter! Isn't it amazing when filmmakers take painstaking care to adapt a source material faithfully!? The first book is so fantastic, so magic, we're really glad it didn't get changed too terribly much! Are you planning on seeing "Fantastic Beasts"?